A most beautiful, heart touching, very emotional, evergreen and timeless classic Hindi movie “ANAND” was beautifully written and directed by Hrishikesh Mukherjee. Every fan of ‘Kaka’ wants to watch ‘Anand’ film more and more time. Rajesh Khanna and Amitabh Bachchan played lead roles. Solid Dialogues, beautiful songs of Anand like, Maine tere liye, Na jiya jaye na and poem Maut tu ek kavita hai was written by Gulzar. 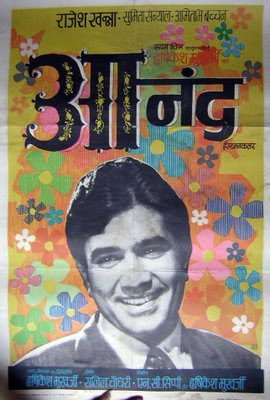 Rajesh Khanna played the title role and Amitabh Bachchan played Doctor’s character as Dr. Bhaskar Banerjee. Raj Kapoor used word "Babu Moshay" to call Hrishikesh Mukherjee. It believes that, when once Raj Kapoor was seriously ill and he thought that he may die, that time Mukherjee wrote this movie and character ‘Anand’ was inspired by him and the movie is dedicated to "Raj Kapoor and the people of Bombay." Film is about a cancer patient (lymphosarcoma of the intestine) who believes that life is about live with full of joy and happiness. In his last days of his life, he comes to Mumbai to live and to meet his friend Kulkarni (Ramesh Dev). Co-incidently Anand met Bhaskar Banerjee (Amitabh Bachchan), a sober doctor upset with dark reality of nation, who is fully opposite to Anand. Bhaskar inspires from Anand, how he live his life happily, and spreading happiness everywhere with everyone, after knowing the fact about his illness. Bhaskar's ‘bak-bak’ with Anand makes him notice the colours behind all darkness in one's life and teaches him a lesson; he decided to write a book on his life. In film, Bhaskar writes diary about his life before Anand, his first meeting then how his relationship changed with him from a doctor-patient to a friend for whom he can do anything, and how a dying man changes his way of thinking to a great extent.